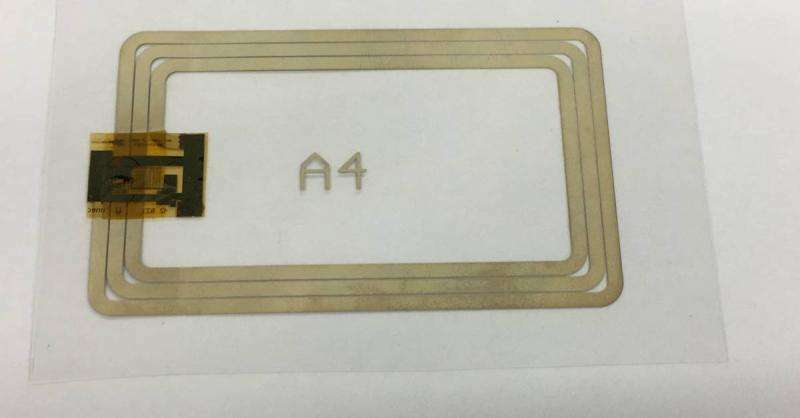 Quad Industries, Agfa, imec and TNO announced today that they have demonstrated a plastic 12-bit RFID tag and read-out system with screen-printed circuitry. The system integrates, for the first time, a screen-printed antenna and printed touch-based user interface, allowing implementation of the reader on curved surfaces. The demonstrator has been designed for badge security applications, but holds promises for many other applications, including smart packages, wearables and interactive games. Imec, Quad Industries and Agfa have, for the first time, integrated a screen-printed antenna in both the RFID tag and the read-out system. This allows for an optimal integration of both devices on a variety of surfaces. The antennas have been screen-printed by Quad Industries, using printing inks from Agfa. The partners have demonstrated the new technology in a badge security application. The access badge combines the credit-card size printed antenna with a plastic 12-bit RFID chip, integrated on a flexible plastic substrate. The RFID tag is manufactured in imec's metal-oxide thin-film transistor (TFT) technology. This technology uses large-area manufacturing processes that allow for inexpensive production in large quantities. The 12-bit RFID developed for this demonstration contains 438 TFTs. The read-out system contains innovative printed functionality at different levels. Firstly, an RFID read-out antenna is screen-printed on a plastic film, allowing optimal integration on flat, curved or even 3-D shaped reader surfaces. Secondly, between the cover lens and the display, a fully printed touchscreen interface with numerical keypad has been added to allow users without a badge to access the building by entering a numerical code. The printed touchscreen was printed using highly transparent screen-printed inks. "Newly developed nanoparticle based Ag inks allow to achieve much lower resistances over conventional Ag-flake based inks enabling to directly integrate new functionalities by screen printing" stated Wim Christiaens, R&D director at Quad Industries. "Moreover the antenna is printed at the same level of the printed touch screen resulting in direct, more cost effective integration of both the printed antenna and the customized touch screen in the reader device." "This printed example shows how Orgacon nanoparticle based silver inks open new possibilities in the market of Internet-of-Things where the highest silver efficiency, ultra-fine conductive circuitry, and a wide substrate choice can bring costs down" said Guido Desie, R&D manager at Agfa. "This demonstration is a noteworthy example of hybrid flexible electronics, combining the advantages of plastic electronics with metal-oxide TFT technology developed by imec and TNO" commented Kris Myny, principal member of the technical staff at imec. "The technology allows for low-cost screen-printing manufacturing, is easily customizable and eco-friendly, and enables direct chip integration on various substrates including plastics, paper and more. The technology promises applications in smart packaging, smart gaming and smart PCB." The prototype system is demonstrated at the SIM User Forum in Antwerp, Belgium. The work on printed conductive structures is carried out as part of the Flemish Met@link project. The work on transparent touch screens is carried out by Quad Industries under the framework of the European project INREP which received funding from the European Union's Horizon 2020 research and innovation programme under grant agreement n° 641864. The work on flexible RFID technologies is performed in Holst Centre, an open innovation initiative set up by imec and TNO.